I’m an uncle for the second time! 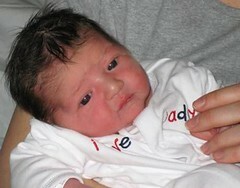 Little Megan G was born yesterday. So cool. She’s abosolutely georgeous. In fact she looks a lot like Lucy. Maybe the whole thing is a fake to get lots of childrens clothes and toys. Suki looks brilliant. Apparently the whole thing was over in two pushes. All the pictures are here. I’ll add more as they come in. Thank’s to Anita for pointing me to the Cyborg Name Decoder. 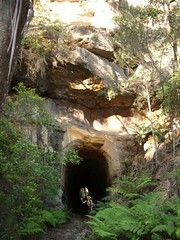 Old Railway Tunnel at Joida CreekOriginally uploaded by NicksMyName. 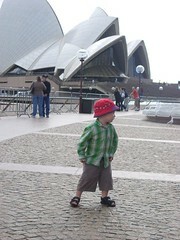 During the Christmas break we went on a couple of good bush-walks. This photo was on a good walk near Mittagong. It ended soon after this fantastic tunnel that was carved out of the mountain to allow coal to be transported from the mine on the far side. I can tell you that a good hour with Rory on your back saps your energy. I think it was at Joida Creek, but I am not 100% on that. It was close to Mittagong. Maybe. We also spent a fun day in the Blue Mountains with Khaled. We had the perfect weather for both walks: not too hot; blue sky; a little wind. The Crowd at Town Hall at the start of the MarchOriginally uploaded by NicksMyName. After an incident on Cronulla Beach where two lifeguards were attacked by a bunch of thugs, a succession of racially focussed attacks happened in Sydney culminating in a riot the following weekend in Cronulla. It was shocking to see this happen in Australia. We were disgusted at the racists, the thugs, the media’s tacit support for the “These people should learn to behave more like us or they don’t belong here” theme and the many politicians who didn’t have the guts to condemn everyone involved. 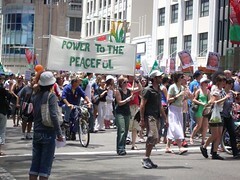 A bunch of student groups hastily organised an Anti-Violence Rally in the city. We went along to give our support. There were the usual speeches which went from the powerful to the ridiculous (“…at the next Census write your religion down as Islamic Sympathiser”). It ended up in Belmore Park where we ran into Sean and Fiona. It was a beautiful day and there was a great atmosphere. We left for Vegetarian Yum Cha before the speeches started again. Mmmm. 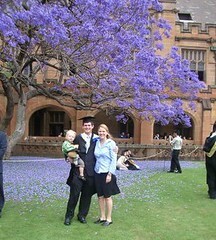 I finally graduated from my Masters of IT at Sydney Uni. It was a great day. When I last graduated back in Dublin I was really nervous and it sort of spoiled the day a bit, but this time I made sure I had a good time. We went out later on for dinner and drinks with some friends. I had a lot of fun. Rory was on best behaviour and looked after his new Graduation Bear very well!